On Monday 17 October barbel were released into the River Skerne near Darlington, and at Clow Beck near Croft to help restore fish stocks and improve angling. 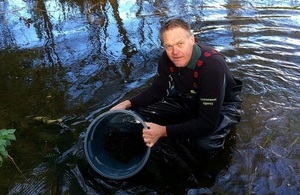 The Environment Agency releases fish into our waterways annually. Fisheries officers target fish stocking activity using data from national fish surveys to identify where there are problems with poor breeding and survival. We’re pleased that we can provide these fish for stocking as part of our commitment to rod licence paying anglers. Restoration and the creation of new fisheries for all people to enjoy is a very important aspect of our work. The River Skerne above Darlington has suffered from poor water quality and habitat degradation in the past, but a concerted effort by the Environment Agency has helped to turn this watercourse around. The fish all come from the Environment Agency’s Fish farm at Calverton, in Nottinghamshire, where around 450,000 fish are produced to stock rivers across the country each year. Many of our industrialised rivers have improved dramatically in water quality in the last 30 years and concerted restocking has accelerated the restoration of natural fish stocks and viable fisheries.